An autopsy performed on Palestinian militant Abu Abbas has found he died of natural causes, said the US military. Brig-Gen Mark Kimmit said he died of natural causes "as a result of arterial sclerotic cardiac disease". 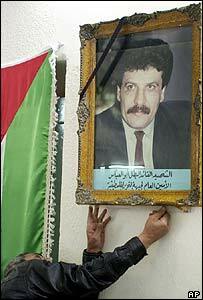 He dismissed claims by the Palestinian Liberation Front, which Abbas led, that the US was responsible for his death. Abu Abbas was behind the hijacking of the Achille Lauro cruise ship in 1985. He was captured in Baghdad last year by US forces and died while in custody. Pentagon officials announced that Abbas, who was in his mid-50s and suffered heart problems and high blood pressure, died on Monday. Palestinian groups, as well as Abbas' wife, reacted with fury. The PLF accused the US of "assassination", alleging that Abbas was denied access to medicines in the days before he died. "I accuse the Americans of having killed him since he died in their custody, either they killed him directly or they neglected him," his widow, Reem Nimr, told the French news agency AFP at her home in Beirut. Brig Gen Kimmit described as "misinformation" the assassination claims. "We all know that to be patently false," he was quoted by AFP as saying. Abbas was one of several PLF members who carried out the 1985 attack on the Achille Lauro, in an attempt to secure the release of 50 Palestinian prisoners being held in Israel. The ship was seized while sailing between the Egyptian cities of Alexandria and Port Said. 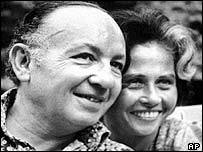 During the two-day stand-off, the gunmen killed Leon Klinghoffer, an elderly, disabled American Jew and threw his body overboard. Klinghoffer's family said on Tuesday that Abbas' death had robbed them of justice for the killing: the one consolation was that he died in captivity. After the stand-off, Egypt gave free passage to the hijackers in exchange for the rest of the hostages - many of them Americans. But the plane carrying the hijackers to Tunisia was intercepted by US Navy jets and forced to land in Italy. Abbas' co-conspirators were sentenced to long prison terms, but he was freed by the Italian authorities, who said they had insufficient evidence to detain him. However, he was later convicted in absentia of masterminding the hijacking and received five life sentences. Abbas reportedly spent around 17 years in Iraq before his capture there in 2003. The Palestinian Authority had campaigned for Abbas' release, saying he was covered by a US pledge not to prosecute former Palestinian guerrilla fighters under the Oslo peace accords. Israel too had accepted his renunciation of violence and permitted him to cross its borders and enter Palestinian territory.